Cells must balance the cost and benefit to optimize organismal fitness. In a recent study, we used the lac operon of Escherichia coli – a classic system for regulatory mechanisms that balance cost and benefit of protein expression – to quantify the economics of protein production (Eames & Kortemme, Science 2012). A current experimental effort is directed towards determining the system-level functions of specific interactions in cells and organisms by systematically modulating biophysical parameters of key regulatory switches. In collaboration with Nevan Krogan’s laboratory at UCSF, we utilize the E-MAP (epistatic mini array profile) technology to characterize the phenotypic consequences of the perturbations we engineer. Understanding the metabolic tradeoffs cells must make when prioritizing scarce resources is important to our understanding of not only basic natural processes like evolution and drug resistance, but also to our ability to design, engineer, and optimize organisms to contain new functions or produce molecules of interest. Our work here aims to understand how different types of mutations - specifically, those targeting (1) function, (2) translational efficiency, and (3) folding - affect the cost and benefit of protein production. Here, we define cost and benefit as decreases and increases growth rate, respectively. We initially hypothesized that mutations affecting function would alter the benefit of protein production, but not cost as transcription and translation would be scarcely affected. Alternatively, mutations affecting translational efficiency (through synonymous codon substitutions) would change the cost of protein production, but not the benefit-per-protein, as the protein sequence remained the same. Finally, we expected destabilizing mutations to affect both the cost and benefit of protein production. We tested our hypotheses using the well-characterized lac operon of E. coli. We were able to measure the cost of protein production by inducing our redesigned lac operons with IPTG, which cannot be metabolized by the cell and thus confers no benefit. To measure benefit, we induced lacoperon expression in the presence of its natural substrate, lactose, which provides a growth advantage when metabolized. Our results challenged not only our original hypothesis, but many commonly held assumptions about the nature of protein expression costs. While it is commonly believed that the cost of expression stems from the cellular resources—including amino acids and ribosomes—it requires, we observed that all costs associated with inducing the lac operon could be attributed to the function of the proteins themselves. Specifically, we found that the mechanism of the lactose permease, which utilizes a proton symport to pump lactose into the cell, was responsible for "expression" costs. Moreover, although it can diffuse across the membrane, IPTG also competes with lactose for transport through the permease. As a non-native substrate for permease transport, it enters the cell more slowly, thus reducing the both cost and benefit to the cell (by inhibiting faster lactose transport into the cell). 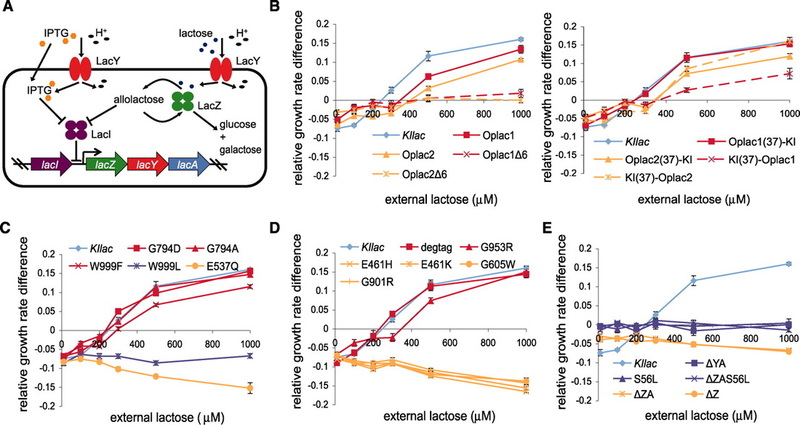 Aside from highlighting the role of epistasis in operon organization, this work also suggests a possible role for the use of allolactose in the cell as the natural inducer of the lac operon. While lactose is the substrate of the operon, the protein responsible for lactose hydrolysis also converts a fraction of lactose into allolactose, which is the true inducer. This seemingly unnecessary second step may be explained as a "systems check" for the operon - verifying the viability of the operon without risking expression of the costly lactose permease. These findings explain control points in the lac operon that minimize the cost of lac permease activity, not protein expression. Characterizing similar relationships in other systems will be important to map the impact of cost/benefit tradeoffs on cell physiology and regulation. In addition, our unexpected finding that the protein function, not the protein expression, represented the cost to cell has implications in metabolic engineering and other biotechnology applications.